The Center for Food Action received a check on February 26, 2004 for $2,500 from Bill O'Shea during a brief ceremony at Bill O'Shea's Florist at the Circle in Hasbrouck Heights. 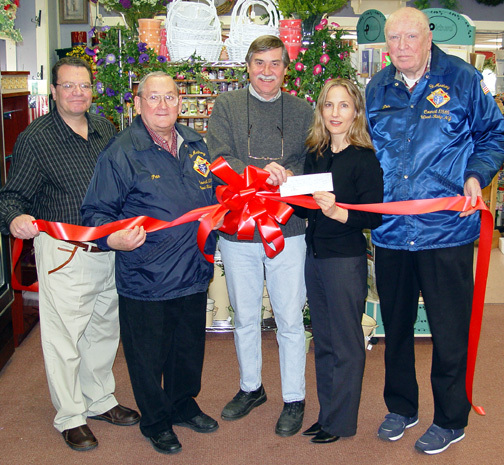 The Center for Food Action (CFA) received a check on Feburary 26, 2004 for $2,500 during a brief ceremony at Bill O'Shea's Florist at the Circle in Hasbrouck Heights. Area residents donated $10 to the Center For Food Action. Bill O'Shea's Florist provided a beautiful red ribbon with the contributor's name on it. Contributors who donated $50 received embellished ribbons. In addition to this contribution to the CFA by our community, the Feinstein Challenge Grant will provide a percentage match of this donation. The Center For Food Action is a non-profit food center that has served our area's needy since 1976. CFA always welcomes donations of basic non-perishable food items such as juice, cereal, canned goods, pasta, baby food, etc. 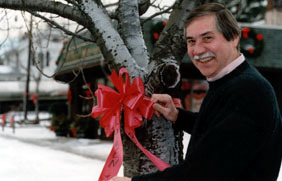 Bill O'Shea's Florist has been sponsoring the Buy-A-Ribbon program since 1998. Bill O'Shea Florist was established in Hasbrouck Heights in 1969.